This project consists in a Linux Gnome application which provides a "caching proxy" function to Musicbrainz Web Service. The services of this application is exposed through DBus. Musicbrainz catalogs and uniquely identifies "music tracks" (i.e. mbid). Their web service provides a convenient method for performing "music track title" (amongst other things) lookup in their extensive database. Applications interface with musicbrainz-proxy-dbus through the DBus. Two (2) types of requests are supported: normal & info, the former having priority in the processing pipeline. 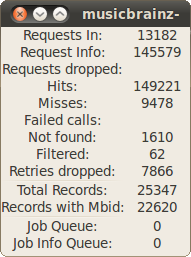 A fixed number of outstanding requests is supported: pending requests exceeding this mark (>8000) are dropped (see "Requests dropped" indicator). The indicator "Hits" refers to successful looked i.e. the entry was found in the local database whilst "Misses" means it wasn't found in the local database. The indicator "Not found" maintains a count of attempts in finding an entry through the Musicbrainz Web Services without success i.e. the entry doesn't exist on Musicbrainz. The indicator "Retries Dropped" accounts for the requests made for already attempted entries that weren't found previsouly: each unsuccessful searches on Musicbrainz will be retried later but in order to avoid having the application being "blacklisted" by Musicbrainz, rate limiting is performed. The indicators "Total Records" and "Records with Mbid" are self explanatory. The "Job Queue" corresponds to the "depth" of "normal jobs" currently waiting to be processed whilst the "Job Info Queue" tracks the "info jobs". There is currently only one application using musicbrainz-proxy-dbus: lastfm-proxy-dbus. For those interested in using the services of this proxy, please see the interfacing guide Dbus API.